Healthy oyster populations and seagrass beds are vital to the health of estuarine ecosystems. Excessive freshwater discharges from Lake Okeechobee and Calooshatchee watershed have resulted in declines of these critical habitats in the Caloosahatchee, San Carlos Bay and Matlacha Pass. To offset these impacts and build resiliency, oyster reefs and SAV lost by the high volume 2013 flows to the N. estuaries were restored. This project was funded by grants from the Florida Department of Environmental Protection, NOAA, the Gulf of Mexico Foundation, the National Association of Counties, and the Nature Conservancy. Sites were chosen to increase resiliency to severe floods or severe droughts at increasing distances from the main source of freshwater, the Caloosahatchee. Sites closer to the Caloosahatchee (east) will have higher oyster settlement and survival during dry periods, while sites farther away (west) will fair better during floods. The map also shows sites located within J.N. “Ding” Darling’s Tarpon Bay. In the Gulf of Mexico, oyster spat is plentiful while substrate is limiting. Degraded oyster reefs can be restored using restaurant-collected oyster shell supplemented with fossilized shell. Oyster density, size-frequency, settlement, and reef associated animals are sampled andcompared to nearby reference sites and unrestored sites. The filtering capacity of the reef was also estimated through a collaboration with Dr. Ray Grizzle from the Jackson Estuarine Lab at the University of New Hampshire. Tapegrass (Vallisneria americana) was planted upstream in the Caloosahatchee near the US41 bridges. ‘Founder’ colonies of tapegrass were established at 6 sites along the shorelines and protected from grazing with herbivore exclusion cages. Shoot density, canopy height and biomass were compared at each site and expansion beyond the cage was measured. Widgeon grass (Ruppia maritima) will be planted at downstream sites using a similar approach. 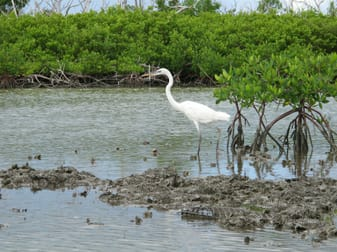 A collaboration with Dr. David Fugate from Florida Gulf Coast University (FGCU) will measure and estimate net sedimentation within the vegetated sites. The presence of SAV is thought to improve water quality by trapping sediments.